Resource Offer: "Intentional: Evangelism That Takes People to Jesus"
Blog Resource Offer: "Intentional: Evangelism That Takes People to Jesus"
Do you find that fear inhibits you from talking with others about Jesus? Fear of not knowing what to say? Or fear of saying the wrong thing? Or maybe even fear of saying too much? If so, you’re not alone. Regardless of what we know, some questions about Jesus can catch us off-guard. Author Paul Williams draws upon his own similar experience to give practical advice for evangelizing. 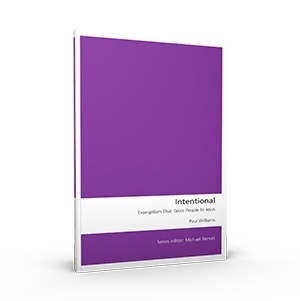 His book, Intentional: Evangelism That Takes People to Jesus, explains how to succinctly and confidently answer questions like, "Why are you a Christian?" and "What makes you convinced that Jesus is God?" Request your copy today. It's a helpful complement to our July series, Crossing the Barriers - Communicating the Good News in Your World.